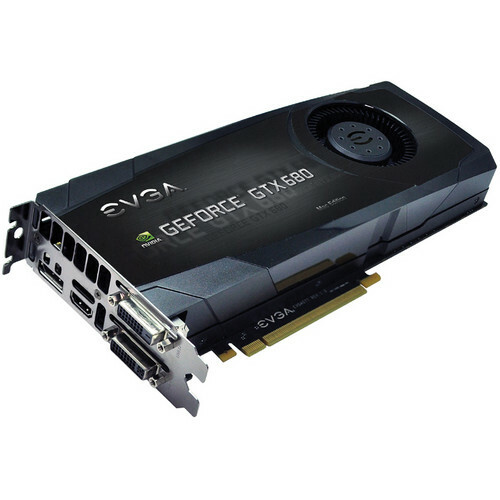 The GeForce GTX 680 Graphics Card for Mac from EVGA delivers a game-changing performance that taps into the powerful new GeForce architecture to redefine smooth, seamless, lifelike gaming. With state-of-the-art features and technology, this graphics card offers a faster, smoother and richer gaming experience. Ensures top-notch compatibility and performance for all OpenGL applications. Two dual-link DVI connectors, HDMI and DisplayPort 1.2. Designed for the new PCIe 2.0 bus architecture offering high data transfer speeds for the most bandwidth-hungry games and 3D applications, while maintaining backwards compatibility with existing PCIe motherboards for the broadest support. Unlocks the power of the GPU's processor cores to accelerate the most demanding tasks such as video transcoding, physics simulation, ray tracing and more, thus delivering performance improvements over traditional CPUs. Dynamically maximizes clock speeds based on workload of the game to push performance to advanced levels and bring out the best in every game. Supports the current standards in GPGPU Computing. Only two simultaneous displays are supported with Microsoft Windows XP. Box Dimensions (LxWxH) 13.0 x 9.6 x 3.0"
GeForce GTX 680 Graphics Card for Mac is rated 4.6 out of 5 by 27. Rated 5 out of 5 by Gerald P. from Don't Give Up on Your Mac Pro I strongly considered throwing in the towel on my 2008 quad core Mac Pro. I'm glad I didn't. I do mostly video editing with Premiere Pro CC. This card has transformed this machine. I hoped that it would allow me to colour correct more easily by displaying my changes immediately without rendering. For that this card is worth the money for me. The real bonus is that the Adobe Video Encoder also leverages this card for faster encoding. Projects are encoding to DVD and H264 at dramatically faster rates. I'm really impressed. Installation was easy but not this card is currently not compatible with the new Mac OS Mavericks. Rated 5 out of 5 by Mr Tea from Now this is what I'm talking about ! I had purchased this little number for my Mac pro 3,1 tower in response to the ridiculous price of the new Trashcan style that Apple released. (I recommend you do the same if you are in video editing or digital arts)Basically this guy blows the pants off of my 3rd party upgrade GPU I had before. Boot time can be a little longer but from what I've read its because this thing is a beast. My premiere pro render times are much more realistic in a less than 1:1 second ratio with minimal to moderate effects in place. It was literally plug and play. Thank you so much B&H, not only did you give me the best price on this but you were among a few companies that sell this and could get it to me as fast as you did.Best wishes to your entire team for outstanding service and products. Rated 5 out of 5 by JC from GeForce GTX 680 Graphics Card for Mac Ive only been using the GeForce GTX 680 Graphics Card for about 2 weeks and it has performed flawless so far. Rendering playback from PP or AE is quick and smooth. Installation was a snap. Directions in the box were a little misleading but no big deal. Before you remove your old graphics card, be sure you go to the EVGA website and download the most recent driver and install it. Rated 4 out of 5 by Richard C. from Worked right out of the box on a Mac Pro With the supplied drivers this $$ graphics board worked right out of the box. Just plug it into the Mac Pro, load up the drivers from the CD, reboot the machine and a great sense of relief is felt as the Mac boots right into OSX 10.8The card is seen by the Adobe software and allows selection of hardware assisted GPU acceleration. I am not using this for gaming so I can't comment on game acceleration. I'm running Creatice Cloud. I can't identify if it is rendering any faster because I'm also just switching from Final Cut 7 to Primere Pro so its hard to judge wit so many variables introduced. What made me decide to get this card is that my wife's video card in her first generation MacPro failed so I removed the HD5770 card from my MacPro to fix her's and since I was without a card I wanted something that would be a significant upgrade. Rated 5 out of 5 by Dsharp from Great Graphics card for Mac This is the best card you can get for the Mac Pro at this time hands down. It is powerful, but the PC version is cheaper, but the Mac won't run it. Rated 5 out of 5 by Peter from Speeds Up MPE It's only been installed a week, but I can compare this GTX680 ot the GTX285 it replaced and I can say there is a speed improvement in Premiere Pro. Running 10.9.2 and installation was a snap. Just remember to download and install the CUDA driver first. Note on EVGA - these folks are definitely not supportive of non-gaming Mac professionals so rely on the good folks at B&H for guidance and the many forums for information.